Did you have a good time this year? Are you going back next year? Are you wondering why you went at all, or what possessed you to whip out your credit card for trinkets that are now looking all too unnecessary spread out on your living room sofa? Reviews, as always, are mixed. My first-timers ran the gamut. I'll post their experiences tomorrow, since they're still trickling in. 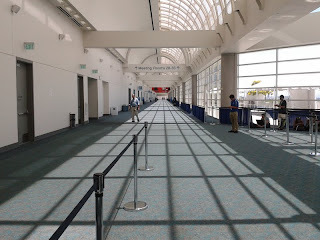 For me - I'm coming to terms with how Comic-Con has changed. I found some new books, met some interesting people, reconnected with some old friends. I bought a lucky Tura Santana tank top, some sleazy B-movies, and the Mattel Julie Newmar Catwoman doll. I got the charge I always get out of hearing passionate artists talk about their work. I waited for comic book discoveries that didn't come. I regretted the time I invested in some panels and wished I had devoted that time to others. Such is the Con. It's not going to go back to what it was. We veterans know that, which is why so many are heading off to other Con shores like Emerald City, or spending their time at Trickster, or bailing on the whole experience entirely. Probably it's best to adjust our expectations and see if the Con still has anything to offer us. I'm sad that most of my friends can't or won't come anymore, but in their place has been a surge of writers and other creatives for me to network with and I'm trying to make the most of that. But I'm a crossover fan, mainly there for the dwindling comic book presence but also interested in some of the TV/film. The Con is kind of like a mothership with satellite crafts that don't always interact - and if you prefer to stay on your gaming or sci fi or comic book ship without visiting anyone else, you might be better off at a specific Con tailored to your interests. I do think it's turned a corner; I think the madness has peaked. Hollywood is obviously the big draw, not comic books, and that won't reverse any time soon. But Hollywood is investing smaller budgets as studies continue to show that despite our zeal, we fans don't really offer much ROI. All those flashy promotional gimmicks cost a lot, as this article discusses. And frankly, a lot of the panels seemed to be dialing it in this year. Seriously, is offering a bit of cast small talk and a trailer (that goes public later that day) really such an exceptional gesture to fans who've traveled from all over the world? I'm sure some people are grateful for any crumb possible, but I know plenty of others who are feeling the value just isn't there. Onto questions. There were so many conspiracy theories this year! Maybe Edward Snowden will be granted asylum in Hall H and give us the inside scoop. Why can't we move to Las Vegas? It's too crowded here. You noticed? Here's the truth: Vegas does not want us. Although they've suffered their own vacancies in recent years, they don't really have the financial incentive to welcome us into their glitzy streets - not the incentive San Diego does. The probably correct theory prevailing in Vegas minds is that we would spend our dollars internally and not in their casinos, so why let us have discounted hotel rooms that could be filled with gamblers? Yes, we'd eat in their restaurants, but that's not how Vegas makes their money. (And gambling on the Strip is not how you make your money - go off-Strip if you visit.) San Diego, on the other hand, is happy to have our money - an estimated $175 million this year. Why don't they fix the badge system, do something about the lines, get rid of panel-sitters? You've just asked the Zen koan of Comic-Con. And there is no bodhisattva who can answer it for us. Probably it's like this; some original, old-school blood at CCI is too entrenched to hand over the reins to people with the brains and balls to overhaul the whole system; the essential imbalance between the center's physical capacity and the massive fanbase can't be fixed; and finally, there's no real motive to implement drastic changes, since CCI knows there will always be a rush of attendees who'll put up with anything. I do think their heart is in the right place. I just think their desire to stay in their comfort zone outweighs their concern for our discomfort. It's not about comic books anymore. It hasn't been for a long time. Most attendees are straight-up rabid for TV and movie panels, and have never even glanced inside a comic book. Yes, Fantagraphics, Last Gasp, Drawn and Quarterly, Top Cow, IDW and a handful of successful indie creators are there - and so are the old-school back issue vendors, Bud Plant, Mile High, and so on. But it's not a cash cow for them. In fact, most are walking a very fine line when it comes to a profit margin. Plenty of indie artists and even mainstream artists just can't afford booth space. And even the ones who come have to pick and choose carefully which product they ship, all of which leads to the inevitable result of only seeing the most mainstream releases out on the tables. How do you get invited to parties? Know the right people. Be cute and charismatic. I'm assuming you're talking about Hollywood parties. Here's a tip - they're really boring. At least they are to my non-celebrity-interested self. The famous people there are well-guarded and you cannot get away with approaching for a picture like say, I did with Kristen Bauer while we were waiting for an elevator at the Omni. Industry parties are most interesting, with more drama and better networking, and your best bet there is being very outgoing and getting to know as many people in the industry as possible. But like I constantly say, most industry people work around the clock at the Con. Think about how tired you get after a long Con day and triple it for them. I know the general impression is that everyone else is out losing their inhibitions at some costumed spectacle of debauchery, but really - not so much. Most people are aimlessly roaming the Gaslamp, drinking in bars with friends, or collapsed in their hotel beds with throbbing feet. Nothing much is going to change over the coming year. In a few weeks, most of us will try to pre-register and many of us will fail. Some of us who can't imagine a summer without the Con will never get a badge, despite our most desperate efforts to do so. Some people will walk away from Comic-Con for good and a new influx of first-time attendees will take their places. But even the people who willingly say goodbye will still be hearing about it and remembering it - and I know part of them will miss it. I had a good time andgot a lot of stuff and got to see enders game and divirgent. It was worth it. I will stay a close by hotel next year though. Staying close by is always the best way to go. Glad you had fun. Please write and let CCI know immediately.